Catch one of the most amazing Pokemon ever - Jirachi, a magical creature capable of making wishes come true - in this all-new Pokemon movie never before seen in theaters! Only once every thousand years when the Millennium Comet is visible in the night sky does Jirachi awaken from his slumber. And when he awakens this time at a traveling circus, he's got a whole new set of friends by his side: Ash, Pikachu, Max, and the whole gang. But soon, they must rescue Jirachi from the clutches of an evil magician and former scientist named Butler who wants to harness Jirachi's incredible energy to bring to life one of the most legendary and powerful Pokemon of all! 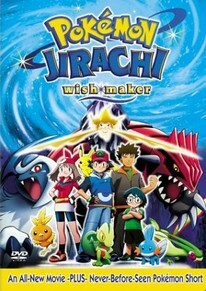 Packed with nonstop thrills, high-energy action, and lots of surprises, POKEMON: JIRACHI WISH MAKER is a wish come true for fans! Spoken Languages: English Dialogue Only.